This DVD teaches male and female bodybuilders the fundamentals of building a step-by-step nutritional program to get into top contest condition. It includes proven ways to add size in the off-season and how to get into perfect contest shape in the 12 weeks before your show! Gary Udit, the highly acclaimed trainer and IFBB judge who created the PERFECT POSING DVD, guides you through the do’s and don’ts of bodybuilding dieting. 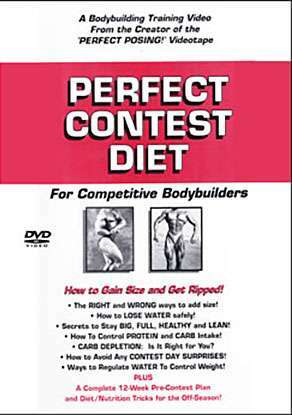 This DVD teaches male and female bodybuilders the fundamentals of building a step-by-step nutritional program to get into top contest condition. It includes proven ways to add size in the off-season and how to get into perfect contest shape in the 12 weeks before your show! Gary Udit, the highly acclaimed trainer and IFBB judge created the PERFECT POSING DVD. He guides you through the do’s and don’ts of bodybuilding dieting, as well as teaching you how to assess your personal metabolism and physique. This allows you to create a custom nutritional plan that works for you. Includes how to gain size, get ripped and get into top shape!